Choosing the right concealer shade can be tricky. You’ve probably been told at makeup counters or drugstores that you need to choose a shade 1-2 shades lighter than your skin tone. But this is incorrect! And it isn’t going to do anything for you at all! There’s actually a bit more to choosing a concealer than this. So I’m going to explain just that now and make it super simple for you so you’ll never again waste money on the wrong concealer. There’s a misconception that the function of concealer is to even out skin tone. But this is also incorrect! That’s what your foundation does. And make sure to read this post where I’ve explained what foundation does in greater detail as well as how to choose the right foundation for your skin type. The function of concealer is to colour correct. For example, if you have dark circles around the eye area, the purpose of applying concealer is to neutralise and brighten those dark circles. The same goes for any spots or redness on your cheeks, chin and nose. Concealer will neutralise and colour correct that redness. So why is it not a good thing to choose a concealer 1-2 shades lighter than my skin tone? Because this isn’t necessarily going to colour correct either of these things for you. It’s literally doing what it says on the tin. It’s just lighter than your skin tone! Which isn’t the right concealer shade for you. If you’ve been using a concealer and wondering why you still look tired or still have redness, this is most likely why. Choosing a lighter shade of concealer will just leave a grey looking tint around your eye area. All that’s going to do is make you look ill and even more tired. Dark circles and redness have 2 completely different colours. So it’s just not possible to treat both of them with just one shade of concealer, light or otherwise. 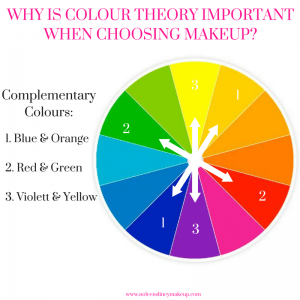 When choosing the right concealer shade, the rules of colour theory come into play. Now don’t worry, this isn’t going to be an art lesson, nor is it going to be complicated. But it is important to know a few basics. If you look at the colour wheel, the colours that are opposite each other on the wheel are called complementary colours. That’s because when they’re placed side by side, they complement one another and increase in their brightness. However, when you mix them together, they neutralise one another. Here are some examples of complementary colours. Blue and Orange are complimentary colours, as they’re opposite each other on the colour wheel. When you mix blue with orange, they will balance each other out. Or neutralise one another. Red and Green are opposite each other on the colour wheel and therefore are also complementary colours. If you mix red with green, they’ll offset and neutralise each other. Violet and Yellow are opposite each other on the colour wheel and therefore are also complementary colours. If you mix violet with yellow, they’ll offset and neutralise each other. Now you’re going to put this colour theory you just learned into practice. And then choose a concealer with a colour base that’s the opposite of it on the colour wheel. Here are a couple of examples for you. These are generally a bluish colour. 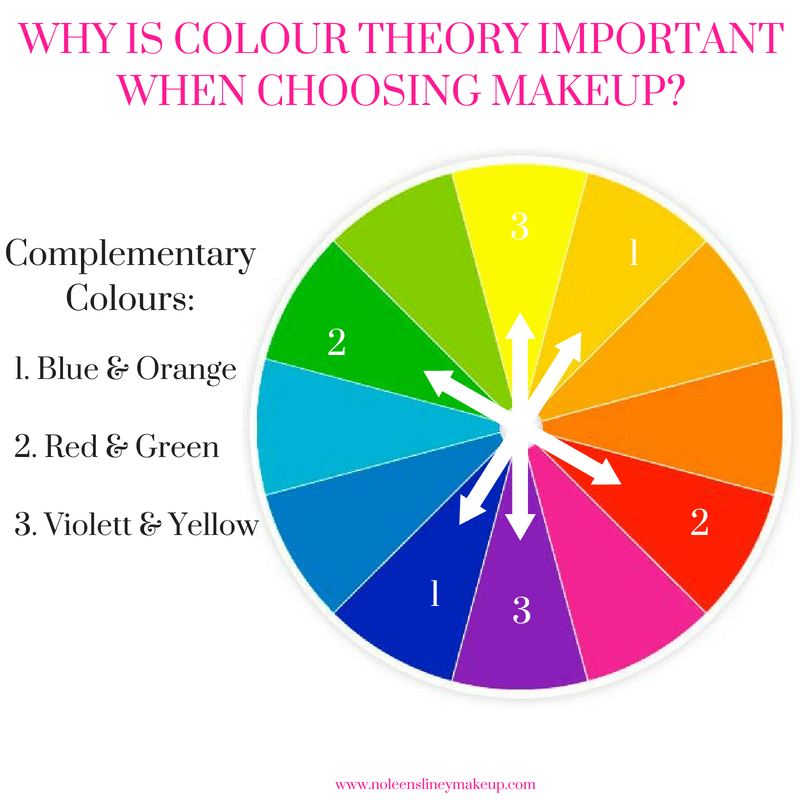 As orange is the opposite of blue on the colour wheel, you need to choose a concealer that has orange undertones in it. As orange when mixed with blue will neutralise those pesky dark circles around your eye area. Now let’s move on to any redness or spots. These are, of course, red in colour. As we’ve already established, green is the opposite of red on the colour wheel. 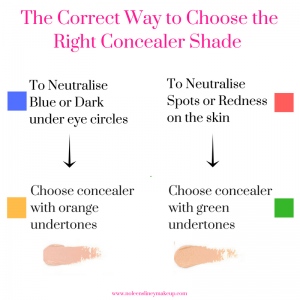 So in order to neutralise any redness or spots, you need to choose a concealer that contains green undertones. STEP 2: look at your skin tone. Now you need to decipher if you fall into the light, medium or dark shades of concealer. Note: if you want to colour correct both dark eye circles AND redness, you’ll need 2 different shades of concealer for this. How can I tell what undertone a concealer has? This can be tricky. Because many of the mainstream brands you find in department stores and drugstores don’t have undertones in their concealers. They’ll often just have shades like light 1, light 2, medium 1, dark 1, and so on. Even some of the very well known, and very expensive, brands don’t have undertones in their concealers. So this makes it very hard to know which concealers have green undertones and which have orange undertones. The reason being, they don’t actually look orange or green! 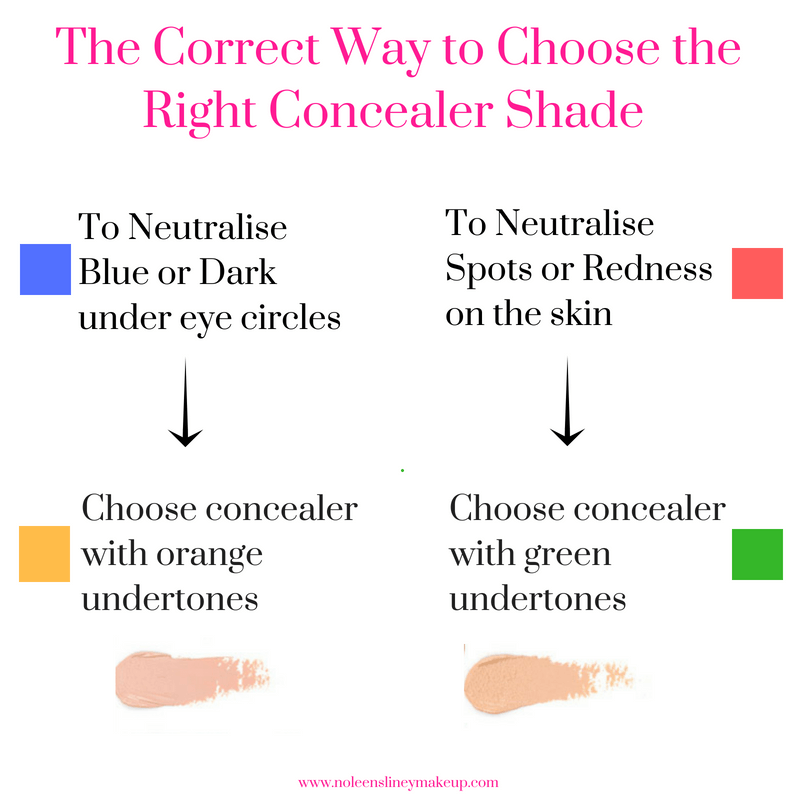 This will give you a much better idea of which one is the right concealer shade for the area you want to colour correct. You’ll generally find this information on their website. One great example of this is the Hynt Beauty Duet Perfecting Concealer. These are my favourite concealers. They’re simply AMAZING and are THE BEST concealers I’ve ever used. They come in 7 shades from light to dark. And each one has a specific undertone to it. 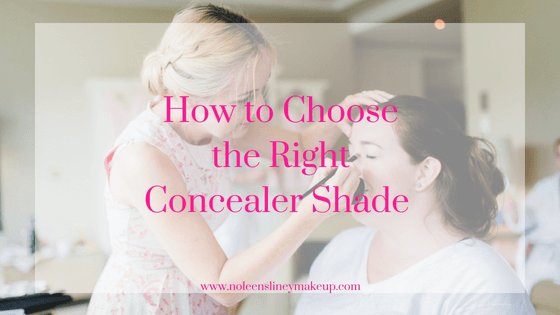 So it makes it easier for you to find which is the right concealer shade for you. They’re amazing at neutralising dark circles as well as any redness. The coverage is unbelievable and you literally need to apply a tiny amount of the product. They can even be used alone for days when you don’t want to wear foundation. I also love that you can get samples of them too. So be sure to avail of that so you can try them out first. Yves Saint Laurent Touche Eclat is NOT a concealer! Whilst this is not a product or brand that I myself use, as it’s not a natural, organic or cruelty-free brand. I thought I’d mention it, as it may be a product you currently have in your makeup bag. And it’s one that there’s a lot of confusion about. This product is NOT a concealer. And it DOES NOT neutralise under eye circles or any redness! It is, in fact, best used as a highlighter. Either way, this is not a product or brand I’d ever recommend anyway. For one thing, it’s not a cruelty-free brand. And this product alone contains many of the nasty, harsh ingredients I always avoid in products such as parabens, talc, mineral oil and dimethicone. Isn’t my concealer a highlighter too? No! Your concealer will colour correct. A highlighter attracts light, creating the illusion of brightness. But most of us need a little extra coverage from a concealer to neutralise and brighten up dark circles first. A highlighter alone won’t do this. If you do want to use a highlighter around your eye area, it’s best to stick to a matte product (Touche Eclat has some shimmer to it). So if you have puffy eyes, fine lines or wrinkles around the eye area, it’s best to avoid products with illuminating properties. Otherwise, you run the risk of emphasising these even further. A highlighter is a great addition to concealer and a nice thing to have. Especially if you have particularly dark under eye circles. But it’s not a necessity. How to apply concealer correctly? The correct way to apply concealer IS NOT how many video tutorials are showing you how to do! So make sure to have a read of this blog post as this will teach you the right way to apply concealer. If you follow this rule as well as the 2 steps I mentioned above, you’ll be able to choose the right concealer shade every time. And if you’re in need of even more tips to brighten your eye area, check out this post where I’ve shared 9 simple tips to brighten tired eyes. I really hope you enjoyed this post and found it really helpful. 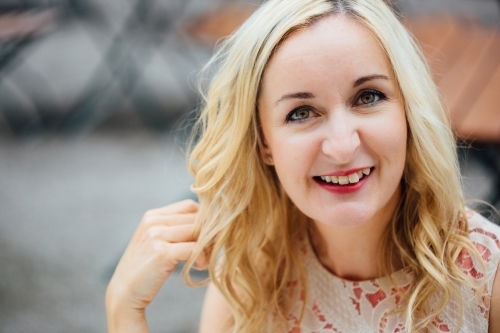 Making the switch to natural & organic beauty products can seem very overwhelming. So I've created this FREE natural beauty guide to help you with just that. Just pop your details here and you're guide will be on it's way to you instantly. I never “got” the Touche Eclat thing. I’m a big fan of minimal makeup and keeping things simple. This was a really helpful post.